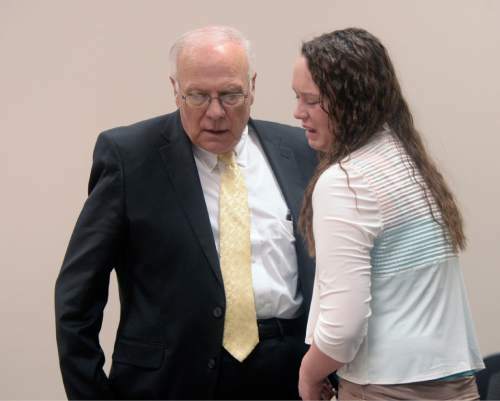 Al Hartmann | The Salt Lake Tribune Defense lawyer Dean Zabriskie consoles Meagan Grunwald at the conclusion of her trial in Provo Friday May 8. Grunwald is charged as an accomplice in a shooting spree that killed one police officer and wounded another on January 30, 2014. Judge Darold J. McDade talks with attorneys during Meagan Grunwald's trial at the Fourth District Court in Provo, Utah on Thursday, May 7, 2015. Grunwald is charged as an accomplice in the 2014 shooting that killed Utah County Sheriff's Sgt. Cory Wride and injured Deputy Greg Sherwood. SPENSER HEAPS, Daily Herald Spenser Heaps | Pool Photo Meagan Grunwald listens as Sgt. Scott Finch, with the Utah County Attorney's Office, testifies about electronic evidence seized from Grunwald's phone during her trial at the Fourth District Court in Provo, Utah on Tuesday, May 5, 2015. Grunwald is charged as an accomplice in the 2014 shooting that killed Utah County Sheriff's Sgt. Cory Wride and injured Deputy Greg Sherwood. Chris Detrick | The Salt Lake Tribune Meagan Grunwald reacts during her sentencing at 4th District Court in Provo Wednesday July 8, 2015. 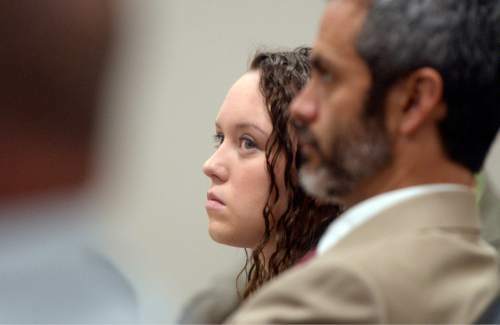 Eighteen-year-old Meagan Grunwald was sentenced Wednesday to 25 years to life in prison for being an accomplice to the murder last year of Utah County Sheriff's Sgt. Cory Wride and the attempted murder of Deputy Greg Sherwood. 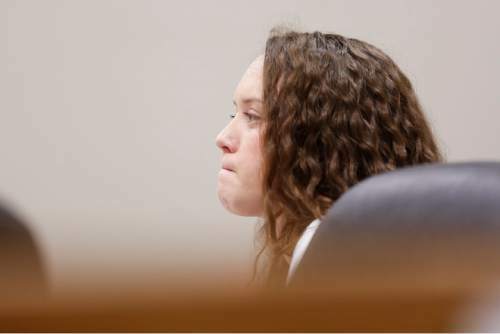 Al Hartmann | The Salt Lake Tribune Meagan Grunwald listens to the prosecutor give closing arguments to the jury Friday, May 8, in her trial in Provo. Her defense lawyer, Rhome Zabriskie, at right. Grunwald is charged as an accomplice in a shooting spree that killed one police officer and wounded another on Jan. 30, 2014. 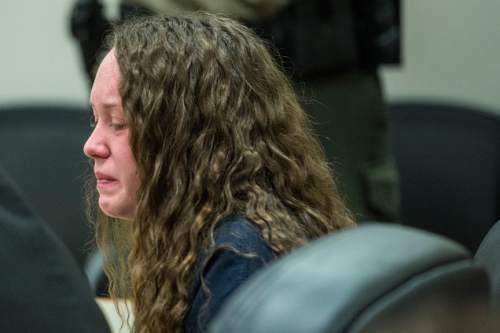 A Utah teen serving a life sentence for her role in a 2014 crime spree that killed one police officer and wounded another will have to wait 27 years  until 2042  before she will get a chance at parole. That was the finding released Tuesday by the Utah Board of Pardons and Parole after an administrative review of the case involving Meagan Grunwald. In May, Grunwald was convicted of one count of first-degree felony aggravated murder and 10 other crimes in connection with the death of Utah County Sheriff&apos;s Sgt. Cory Wride. In July, 4th District Judge Darold McDade ordered her to serve a prison term of 25 years to life and a consecutive term of five-years to life on an aggravated murder charge. Punishments on the additional charges were ordered to run concurrently. Under Utah law, the state parole board ultimately decides how much time a convicted person spends behind bars. Per the board&apos;s decision on Oct, 19, Grunwald, 19, will be scheduled for an initial parole hearing in July 2042, documents released Tuesday show. A jury found Grunwald was criminally culpable when on Jan. 30, 2014, she drove her truck through two counties as her boyfriend, 27-year-old Jose Angel Garcia-Jauregui, fired a gun out the back window at police officers and passing motorists. Wride was killed, and Deputy Greg Sherwood was severely wounded. Garcia-Jauregui was later fatally wounded during a shootout with officers in Nephi. Grunwald, then 17, and Garcia-Jauregui were on the side of the road in Utah County when Wride pulled up to see if they needed help. Wanted on an outstanding warrant, Garcia-Jauregui gave the 44-year-old officer a false name and then killed him as he checked their licenses. At trial, Grunwald testified that Garcia-Jauregui threatened to kill her and her family if she didn&apos;t do as he said. Prosecutors argued Grunwald was a willing participant in Wride&apos;s death and used police dashboard-camera recordings and witness testimony as evidence to counter Grunwald&apos;s claims that she was threatened to act as her boyfriend&apos;s getaway driver. Grunwald&apos;s attorneys have appealed her conviction, claiming in court papers that McDade was biased against the teen and crossed the line in some of his comments during her sentencing. 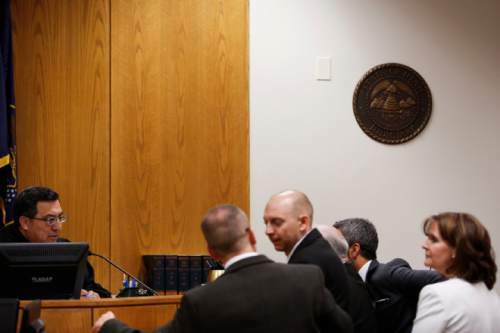 Deputy Utah County Attorney Samuel Pead has called the motion "pretty typical" in a murder case, and he said prosecutors don&apos;t believe there was anything  including Grunwald&apos;s assertions that the judge was biased  that would justify a new trial.